Sacking of brother Alan was "shocking"
Only a few weeks back, yet another Oasis drummer parted ways with the group. Zak Starkey - son of Richard Starkey (aka Ringo Starr) - left Oasis after a reported series of rows with songwriter Noel Gallagher. Now, Steve White - Paul Weller's longtime drummer and elder brother of Starkey's predecessor Alan White - has criticised the group over White's departure in 2004. In an interview with culture webzine Zani, Steve White says the following about his younger brother's surprising departure from Oasis. Steve White: "There were some disputes about meetings. I wasn't there so I couldn't comment. What you would get would be a story from either side. I am sure they've all got their opinions, and I respect that. The bottom line is that Alan got a call four days before Christmas from 'The Manager', and he was told he was out of the band. And he hasn't seen or heard from Noel or Liam since." White continues: "All Alan wanted, was to have a pint of Stella, and the guys to say what we want is to get Zak Starkey in, as we don't think you're right for us anymore. Alan would have had no problem with that, as nothing lasts forever. But it was just the circumstances of the events which were shocking. They shocked me, and they hurt Alan. 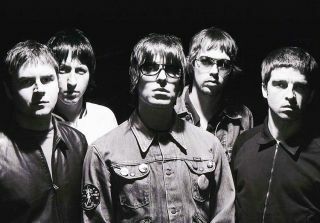 "…(Alan) would love to play again, but I think he was really hurt the way it was done, with Oasis. But he wasn't the first musician that it had happened to. "But for someone like Liam, and Noel, who presents this image: I am tough, I am hard, and I can take on anyone. They couldn't stand there, face to face, with Alan, I don't like that." According to Wikipedia, the Gallaghers paid White nearly £350,000 to buy him out of Oasis's company Definitely Maybe. White played on four Oasis albums between 1995 and 2004, but is now a property developer. Noel Gallagher has recently confirmed the arrival of Oasis's fourth drummer, Chris Sharrock. Click on the link for the rest of the Steve White interview, an excellent read for any drummer that covers a lot more besides.